Jordan Brand made waves after the release of their previous Air Jordan Retro 11 release and this July 2011, JB is expected to hit strides once again with the release of another colourway of one of the well-loved Air Jordan Retro shoes. The new Air Jordan 11 Retro came out in the market last week in Black/Varsity Red – White colourway and is currently enjoying success with the positive acceptance in the sneaker world. This new edition features an impressive black leather upper with a white midsole and black outsole. 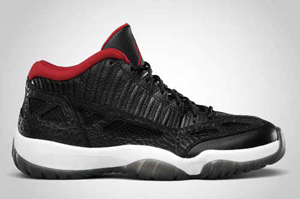 With its popularity, this new Air Jordan 11 Retro is a must but this month!